And don’t you guess- it’s korean foods day again. Because this supermarket is new to me. I will try all the foods they have. Missed to make a photo from the other noodles packages I bought. Even if I have the money to do it, I do not really enjoy going to restaurant. And why if I can live 3 or 4 days from that. Much more to eat + drinks as well. The waiting also makes me uncomfortable really. Sometimes I go to Mc Donalds- because there I never have to wait + there is always a free table. And staff is friendly- if they can do it, they will. But Mc Donalds…really is not so interesting. Years ago I sometimes bought Burger King Whopper meals. Then I was thinking I do not want to become used to that kind of foods. 2 Edible seaweeds. Deep frozen melon soft cake. Rice noodles. Coffee (ready to use preparation with milk and sugar). Juice + lemonade + soy sauce from Aldi. 3 I wish there would be a japanese supermarkets or another asian market with japanese foods. All markets I saw only have very few japanese foods such as Kikkoman soy sauce, and Ramune bottles (very small amount to drink). The one or the other way I will also have that soon. 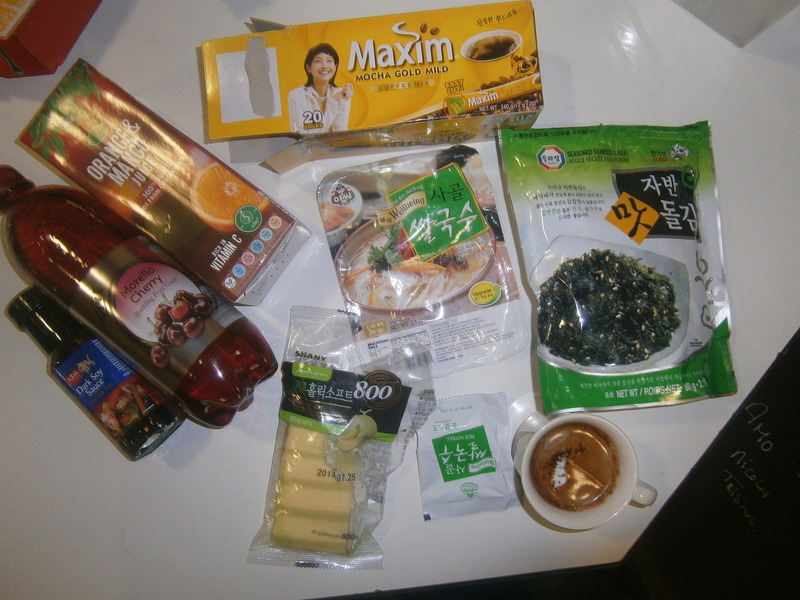 For the time being, I use korean foods. Or I should use Aldi stuff more + save money. But really…i have to afford these noodles and kinds of stuff to feel good. 4 There are also some All-you-can-eat places here in central Dublin. I tried once. But it is not so cheap. Of course you could really hog the food and go three times or so and eat until you can’t anymore. I do not really feel comfortable about that either, even if I could do it. So really there was never the big wish to go there all day or just again once. It costs 7 Euro or so and if I use (instant) Noodles it costs me half of that. And you can never really stay a longer time inside a restaurant. Only Mc Donalds you can really stay an hour no one will bother + look out of the window. Yes why not look out of the window but it is always the same one. The other Mc Donalds are not so good except one but it is a bit far away to walk. And Burger King…they have one meal or Whopper on discount now each day but I never tried. 5 Really restaurants are not my big thing in life. Supermarkets are, I tried all the local one’s for different foods products. So I really almost never eat the same stuff. For some years I was eating pizzas a lot but then figured out they are made from white meal. Drug store beetles don’t thrive from that. Regular western noodles also are made from white meal but a different kind. Not really totally white. If you use the wrong nutrition you die younger that’s a fact, and if you use the optimal nutrition you can get 80 years old or more. I mean yes go Mc Donalds or Burger King sometime and eat pizzas and chicken meat- but you won’t get old if you eat it a lot and at least will get health problems. Really like a computer program- get the most optimal foods for the lowest possible cost + the most possible variation so it does not get boring. The Korean coffe stuff actually is not so good in terms of that- but I had to try it. I really had to. I DO NOT SHARE A LINK. I WRITE A BLOG POST. Because facebook is weird and twisted, I copy them to tumblr now always or even I only write on tumblr and then really post a link here. 2 The last thing I want in life is a sloppy girlfriend- thriving on junk food or having a taste for expensive stuff + going out and having party a lot. Or even being drunk all day. So think…I have optimized the way I buy and use foods a lot. Even if I often make exceptions and go to Mc Donalds or buy junk foods. And I am in no way into health foods or alternative or vegetarian. Just…chicken meats are unhealthy and so is beef and most meats. Pork and fish meats are the best to use but also I don’t really use much. Here in Ireland nutrition is really kind of junk- the typical irish meals contain chicken or big pieces of meat each day. The traditional irish breakfast you can get here in many buffett bars, hotels and so on is: Roasted bacon, black pudding (made from pigs blood) and also sometimes a more brown variety of pudding as well. Plus egg and white toast. I often was eating this stuff in past years. Really Ireland in terms of breakfast- so much stupid and totally no creativity (there is almost only one kind of that variety of breakfast and it is very common). That takes off 15 years or more from the life expectation. Not to say we have all kinds of modern high tech supermarkets where you can find most European style foods. In the 1970s or so they just started to appear. 2 People who eat a lot of beef really turn kind of bovine after passing 40 years. Maybe their minds too…nothing against them but that is reality. You are really composed of what you eat. Seaweed is very good I think. And fruits + some brands of fruit juice drinks. 3 I mean really this is all kind of boring and not too interesting for most people- what if you can gain 15 years longer life or even more- without spending extra money? Just by being very selective what you buy + eat. 4 I really use all kinds of SNS like a diary- I feel invited and free to do so, to write whatever I wanted to. When I can not write it or express on the internet, IT MUST DISAPPEAR FROM MY LIFE. Really. For the time being I use facebook and tumblr. Some years ago I used flickr, and photobucket.